These are the moments when you least expect it and it makes you feel special. So I was on our veranda that morning with the tropical summer breeze cooling me down. 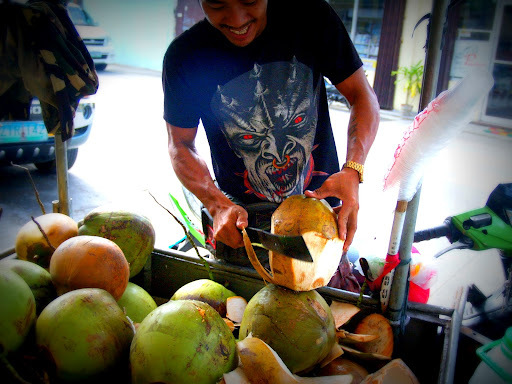 I saw this street vendor hawking buko (coconut), aimlessly driving his bike carrying a wagon-full of buko. Unlike Lance Armstrong, the vendor pedals his bike like he has no worries in the world. And this is what I like about my hometown - it is so laid back. Amidst the chaos in the streets and the cacophany from the cars and tricycles around, the site of this man was novel. 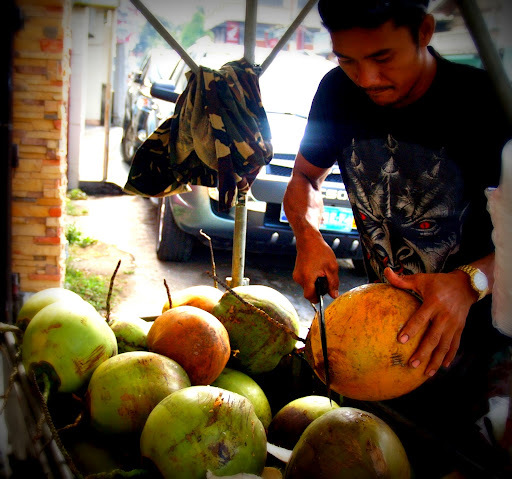 It created a subtle curiosity in me on how to buy from a street vendor. So I waved my arm and called him like one would hail a cab. And there he was..
"No it's for my blog" I said. 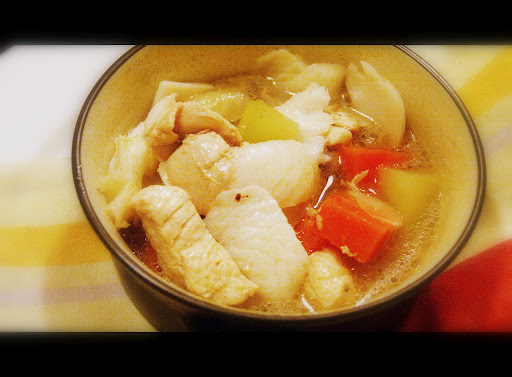 It was even better when it was used to cook a pot of chicken soup ..as it added a sweet note to the dish! So let me share with you the recipe that Lani served us in one of our meals. Enjoy! In a heavy skillet, saute garlic and onions in oil. Give it a quick stir. Wait until the garlic and onions starts to soften and a fragrant smell wafts across the room. Stir in the ginger. Quick stir again and add the chicken cut ups. Allow the chicken to cook for 4-5 minutes. 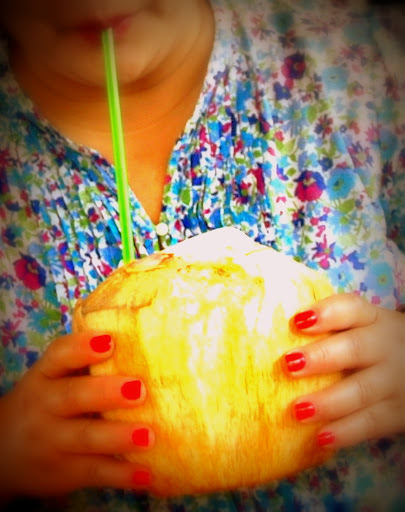 Pour in the coconut juice. Let it simmer. Add the vegetables and allow it to cook until tender. Season with fish salt. 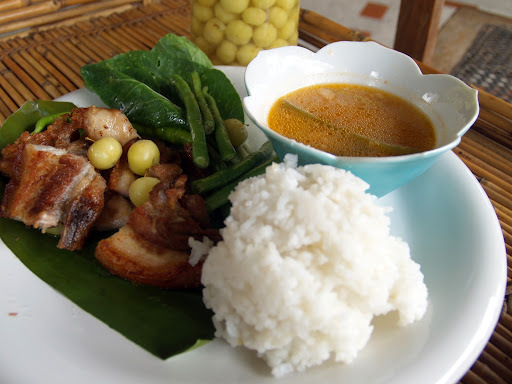 Add coconut strips and voila you are ready to enjoy the pleasure of slurping and tasting the tender goodness of the chicken and the coconut meat. She is a pharmacist who has been running their family owned Pharmacy and the oldest hospital in town, but for me she has always been the culinary doyen as long as I can remember. 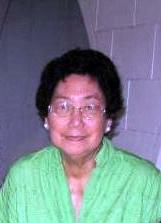 Tita Bess is the mother of my brother in law. I have been wanting to feature her for my guest post Wednesdays (although I have shared some of her recipes in this blog). And I was thrilled when she invited me over to her house one afternoon during my recent trip back home. It was an afternoon filled with fun and great company. Those invited included my sister in law Arlene, who is a caterer extraordinaire, my niece, Ayi, a young food enthusiast, and my old friend, Mia (Tita Bess' daughter who is a dedicated wife and mother of two sons). 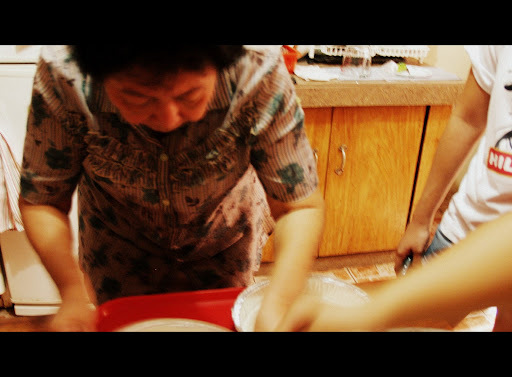 Cooking has always been close to our hearts and we were all so comfortable being in the kitchen. 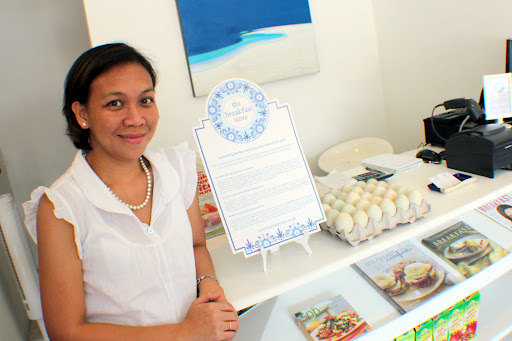 Tita Bess was going to share with us how to make tibuk-tibuk, a Kapampangan specialty. She is the expert to go to as her family's roots hail from Pampanga. 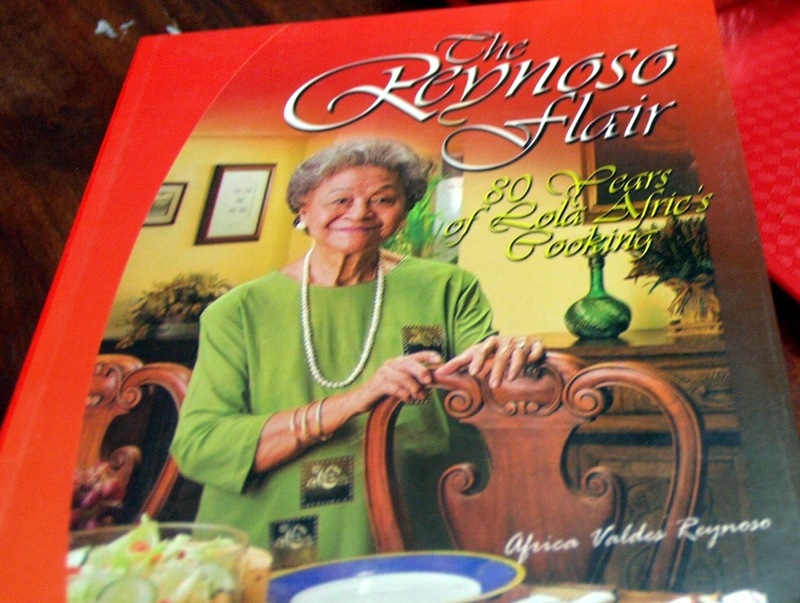 She could make tibuk-tibuk from memory but that afternoon she handed us (yes we took home our own copies) a cookbook of her aunt Africa Valdes Reynoso, The Reynoso Flair. 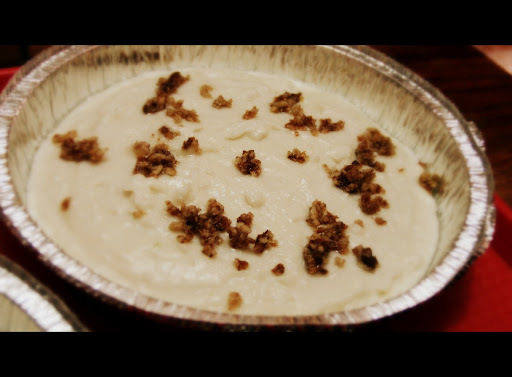 Tibuk-tibuk is a delicate creamy dessert and I would dare say that it is the panna cotta of the Philippines. 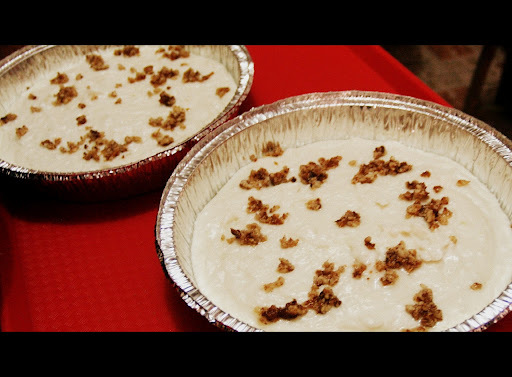 Okay it may not be as refined as what the Italians have but it has the same smooth and velvety texture, and it lends to a decadent, creamy delightful dessert. Grate one coconut. Add one cup of water and squeeze. 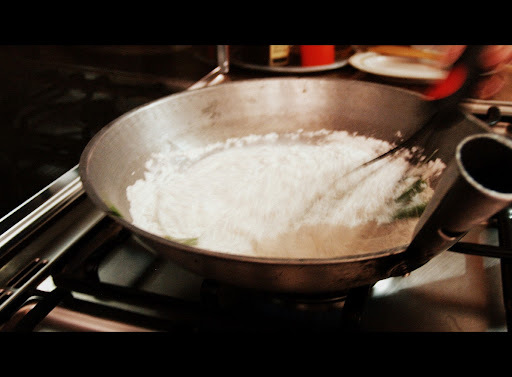 Pour the coconut milk in a thick sauce pan. Let it boil and continue to stir until most of the liquid has been reduced. 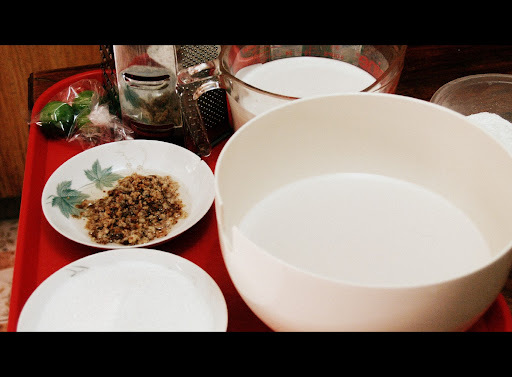 The milk will begin to change its color to slight brown. Don't overcook, set aside for garnish. 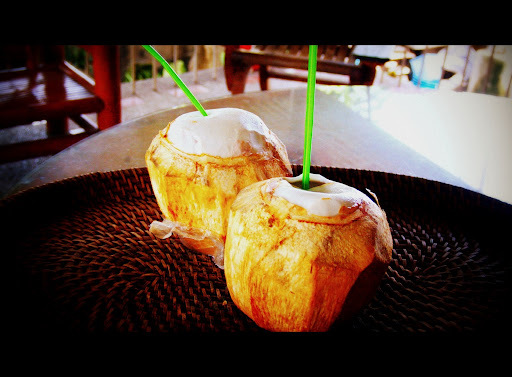 Pour 2 1/2 cups of hot water over the 3 grated coconuts. Squeeze until it yields 3 cups of the first extraction. (In Tagalog that's called kakang gata). Set aside on a bowl. 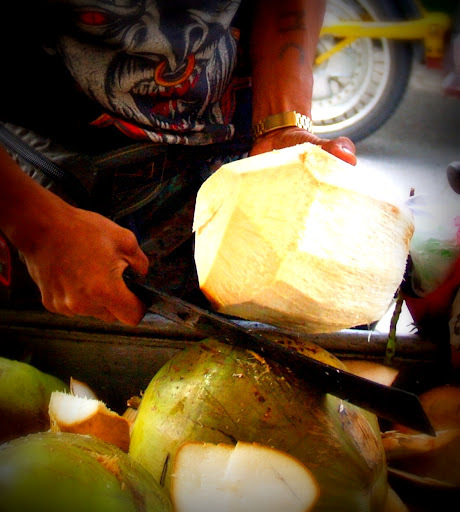 Pour another 3 cups of hot water on the grated coconut and squeeze the second extraction. 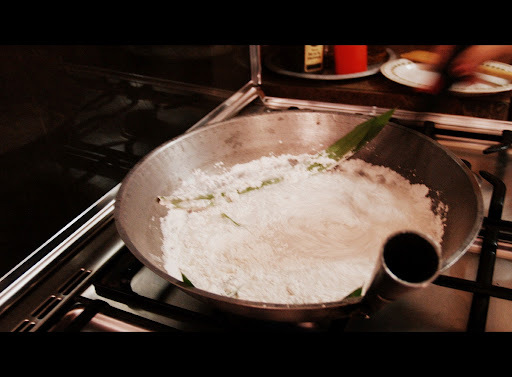 Place in a saucepan 1 1/2 rice flour and pandan leaves. 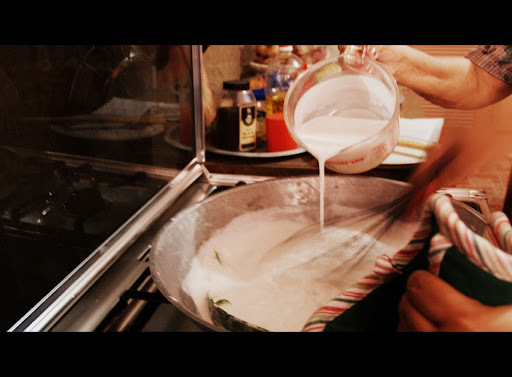 Add the second coconut milk extraction a little by little while continuously stirring with a wire whisk. When the mixture thickens, add 3 cups of the first extraction. You must add it slowly to avoid forming lumps. When quite thick, add milk and sugar. Continue stirring (about 15 minutes) until thick. 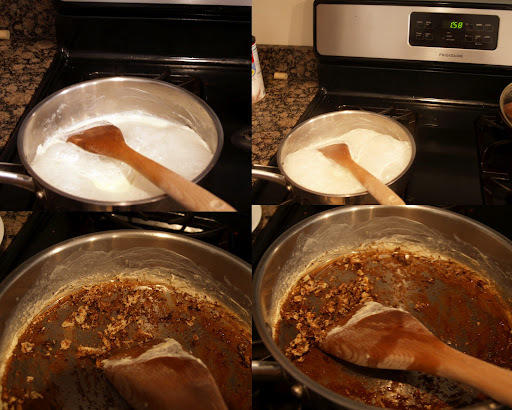 Add the rinds into the thickened mixture. While I'm back to my home base, I still cherish that afternoon. Because in between stirring and cooking came the swapping of stories and reminiscing our childhood days that elicited laughter. Lots of laughter. Although separated by time and distance, we all share the common joys of cooking... and the memories forged that afternoon is as sweet as the dessert that we just made together. Memories that will last a lifetime. Thank you Tita Bess and Mia for having us at your house. Arlene and Ayi, thank you for joining us that afternoon. I love being with my Mama. I remember putting my arms around her soft shoulder and tightly squeezing as we weave our way around town. To wake up next to her in the morning was like a dream. To get a glimpse of her daily routine... praying bead after bead of her rosary... to see her stay true to her promise to my Papa even beyond "through death do us part". I'm glad that after living abroad for the past 13 years I was lucky enough to stay with her for 3 weeks - which was oh so precious...and 'twas truly a gift. I am sure she loved those moments too. The other day while I talked to her over the phone, she conveyed to me how much she misses me especially my cooking. 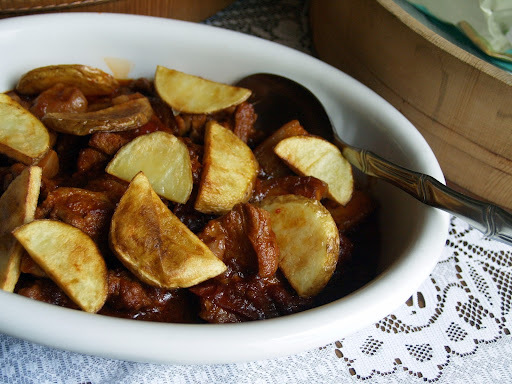 "Martha (her cook) is back to cooking adobo again" she said in between giggles. "What??? It's barely a week after I left and she's back to adobo? I purposely used local ingredients for her to easily re-create the dishes". I said. 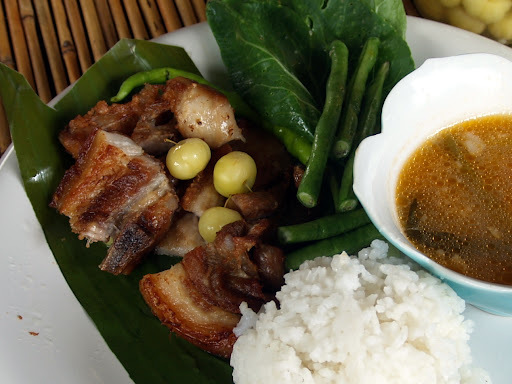 Oh she tried but her Crispy Sinigang sa Bangkiling (Crispy Pork Belly Soured in Tahitian Gooseberry) didn't turn out to be like yours. So for that purpose let me share with you one of my Mama's favorite dishes that I created for her while I was on vacation. But first let me discuss with you what gooseberry is all about. So who's ready to pucker up? haha! My mom was so excited to bring home Karamay for me from the market that day. Karamay is how we Ibanags call the little tiny yellow fruit almost the size of a blueberry. But don't let its size and radiant color fool you. This fruit is really sour. Since I didn't know the English nor the Tagalog term for it, I posted it on my Facebook wall for my FB peeps to help me. Lo and behold I got so many reactions from my friends. I found out that the tagalog term is Balingkikng; Tahitian Gooseberry in English. 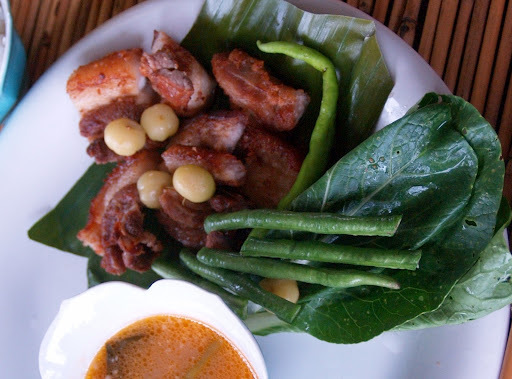 And voila, that was how this dish called Crispy Sinigang sa Bangkiling (Crispy Pork Belly Soured in Tahitian Gooseberry) came about. The dish was sensational. I cooked it over and over for the time I was there. 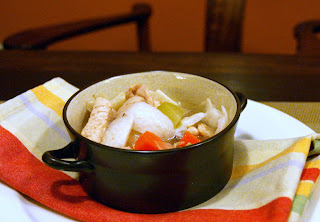 My family couldn't resist the crunchy, crispy pork belly punctuated with a sour soup. The vegetables also made this a one pot meal that delighted everyone. 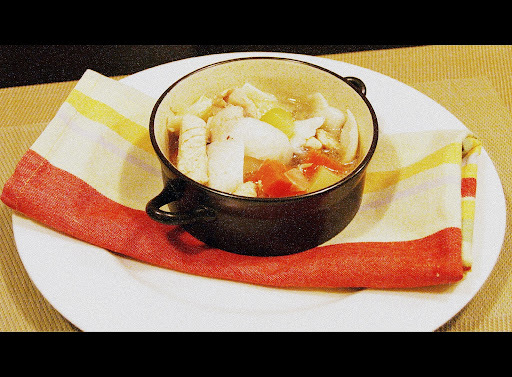 Other vegetables that you could add on include: taro, bokchoy and chili to give this dish a kick. First let's extract the gooseberry juice. 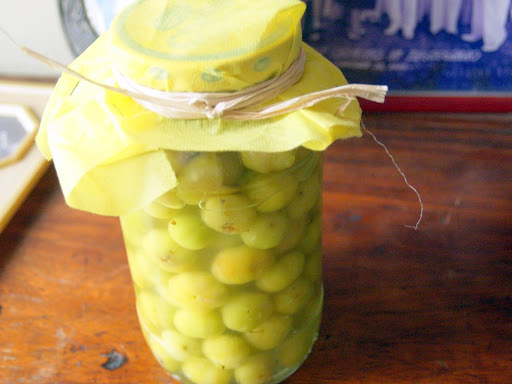 In a stockpot, boil 2 cups of tahitian gooseberry submereged in water. Cook until the meat falls off from the seed. Now mash the gooseberry and extract as much juice from it. 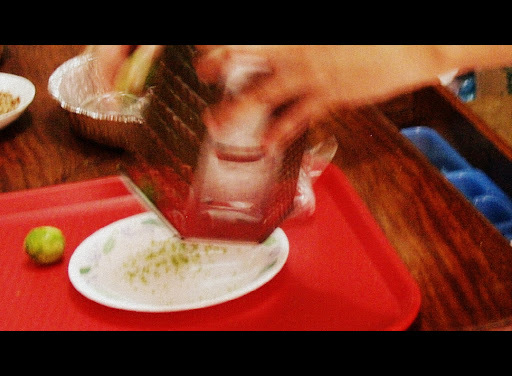 Use a strainer. Discard the seeds and pulp and set aside the juice. Now in a pot, boil rice water (water used for washing rice) onions and tomatoes. Add the pork belly strips. Cook until tender. Add the vegetables and the extracted juice from the gooseberry. You may want to add a small amount first then see from there. Season with fish sauce or, if unavailable, with salt. That's how we were for the duration of our stay in Manila. Our hosts, O and D, really know how to take care of their guests. The warmth and hospitality that we were fortunate to experience far exceeds the five star rating in hotels. Because I'm sure just like you guys, nothing beats the feeling of being with family meal after meal with the accompanying conversations filled with laughter. As a bonus all your needs are taken care of, you have nothing to worry about. You are definitely on vacation mode, as their well trained household crew treats you like family. (Thank you D and O and to the rest of your household crew! 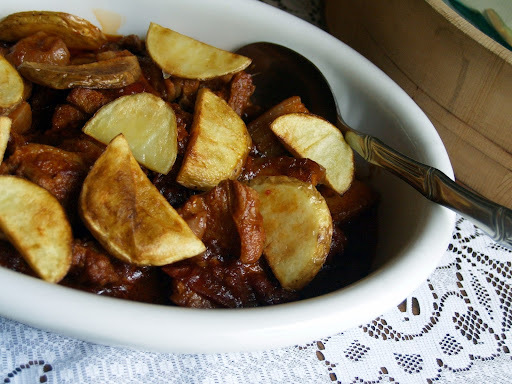 For today's post I would like to share what Lani calls Pina-Asadong Baboy sa Kamatis (Tomato Braised Pork) The soft and tender pork that was slow cooked to perfection will knock your socks off. Pour the water in a stockpot. Add tomatoes, soy sauce, sugar and onions. Boil the pork until tender. 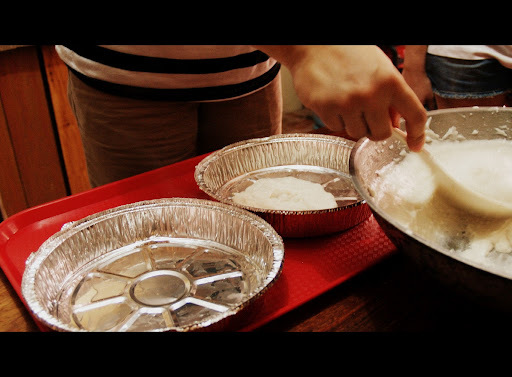 On a suacepan, add cooking oil. Saute garlic and onions until they are soft. Pour the tomato sauce and add the pork. Cook until sauce is reduced. Season with salt and pepper. 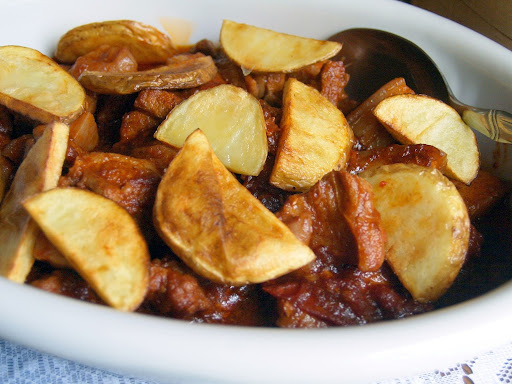 Garnish with fried potato wedges... enjoy! I just got home from a 23 hour flight from the Philippines, so I'm jet lagged and still in the process of unpacking my bags. And my mind is bursting with all the stories that I want to share with you. I've got piles of notes and gazillion pictures to share. But quite frankly, I don't know where to start. So let me start with breakfast... just like how most of us start off our day. 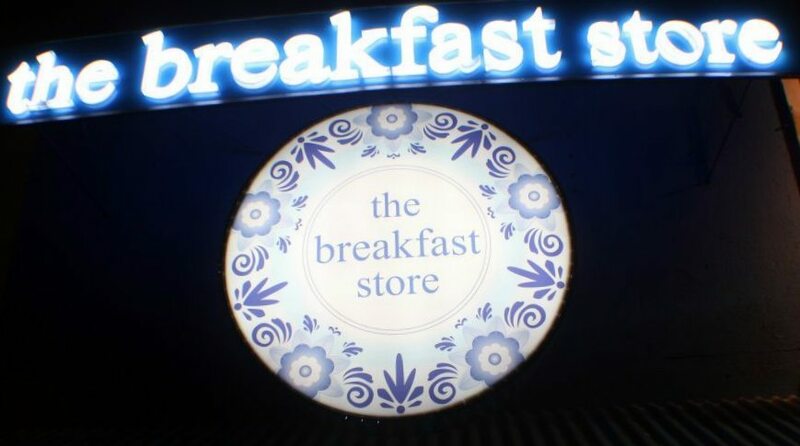 When I say breakfast what I mean is to literally share with you a specialty shop called The Breakfast Store. The blue and white themed store catches your attention when you pass by Katipunan Avenue in Quezon City, Philippines. Let's hear it from the shop owner, Sigrid, what the store is all about. Breakfast has always been called the most important meal of the day. In my family, we had celebrated birthdays over breakfast. I carried that on over to my own family now.. Then last Christmas, we gave out gifts of cacao balls (chocolate balls for breakfast) to family and friends. Everyone started asking where they could get more of it, That's when we started exploring the idea (over breakfast of course) of coming up with a store that would sell everything for breakfast. So when we thought of an apt name for it. I simply suggested, The Breakfast Store because it is what it is - no pretensions. You come into the store with a clear idea of buying items you will have for breakfast! 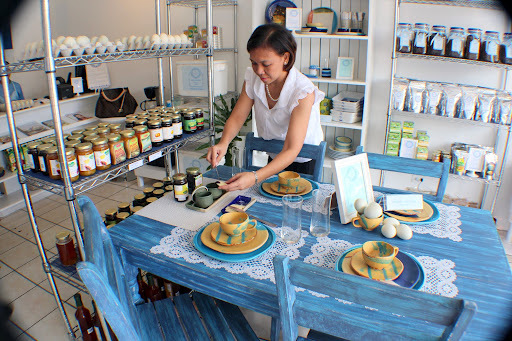 As you enter the store, there's a charming blue table that greets you and it is where you find the specials and samples that the store offers. That day, I sampled tomato jam preserved by local artisans. It was my first time to have tomato jam so it was a pleasant treat for my taste buds. I call their kesong puti (Filipino cheese similar to a cottage cheese) kesong puti on steroids, as it was oozing and bursting of new flavors. 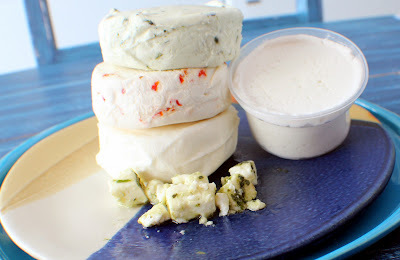 My favorite was the cheese with herb and garlic. 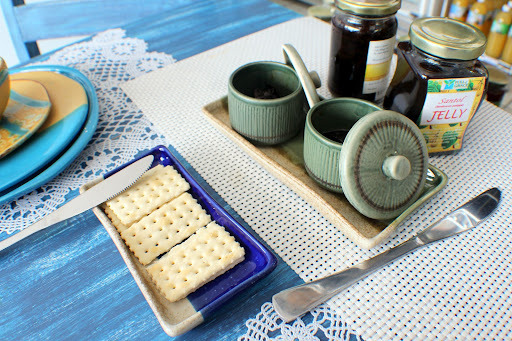 I thought that it would make any breakfast special, with specs of herbs the local artisan blended with the cheese. Also, I had this chilled taho. 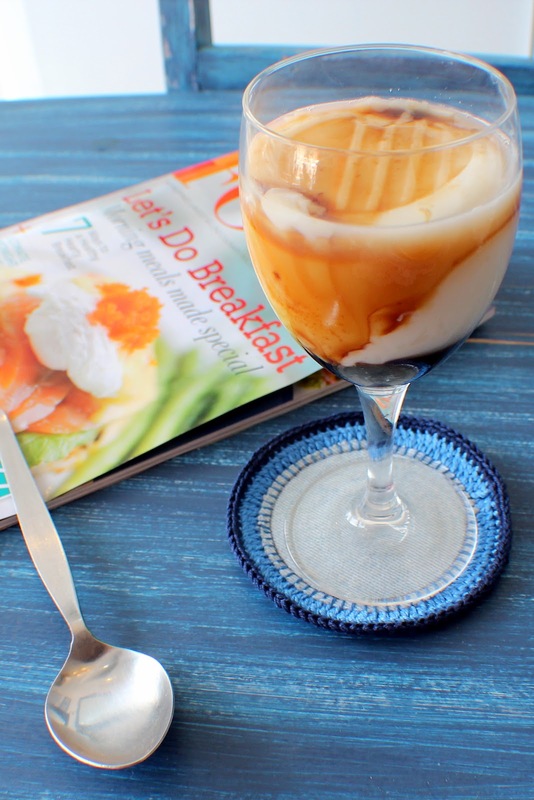 Taho is a sweet blend of tofu and special syrup. It's usually peddled in the street around the neighborhood and it's usually served warm. It was the first time for me to have it chilled and it was a refreshing treat on a hot summer day. 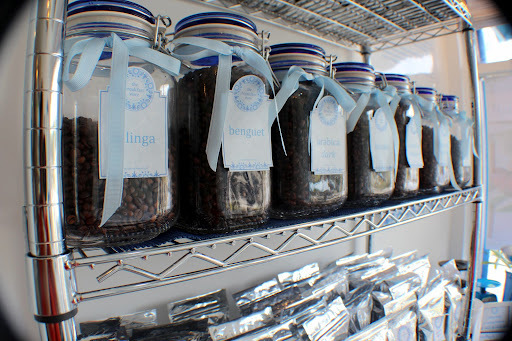 What is breakfast without coffee , so at the breakfast store, they sell locally grown coffee beans from different parts of the country. They sell everything that pertains about breakfast and they didn't miss out on the plates as well. 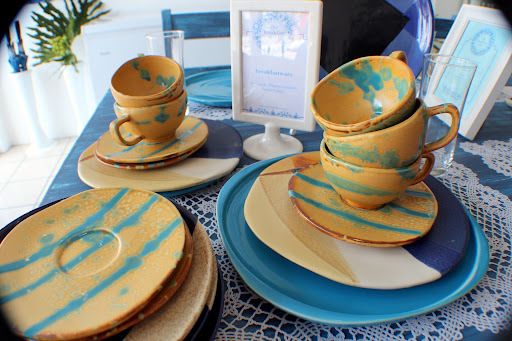 I adore these plates designed by Lanelle Abueva Fernando, a well kown handmade ceramic artist in the Philippnes. 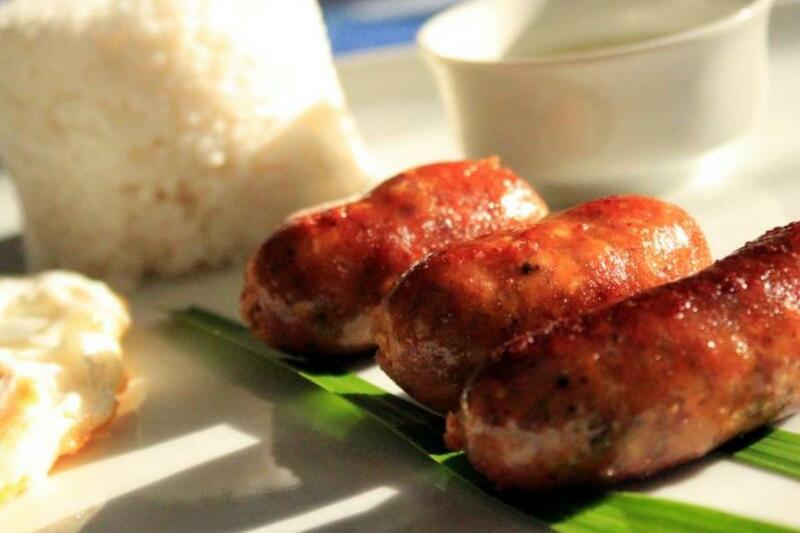 My favorite is the longanisa or sausage from Tuguegarao. It's tangy, garlicky and a tiny piece would demand a spoonful of rice (oh my carb loading). They also have other longanisa variations from other parts of the country such as Lucban in Quezon, and the famous Vigan longanisa... now really please pass the fried rice and eggs and I'll be ready for the day! 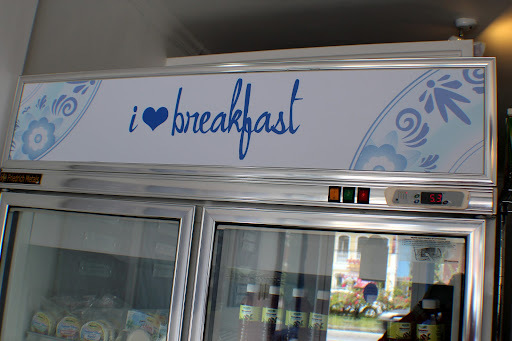 I love breakfast, as their sign says, but with what the store offers this maybe an understatement. Once you come in, you're definitely in breakfast heaven! No worries, that's just a few more days... and I promise, I'll be lugging along with me a luggage full of interesting stories, reviews and recipes to share...so I'll see you soon!! !